I did this sketch last Sunday night while watching a repeat of "Larry King - Live" that had run earlier in the week. 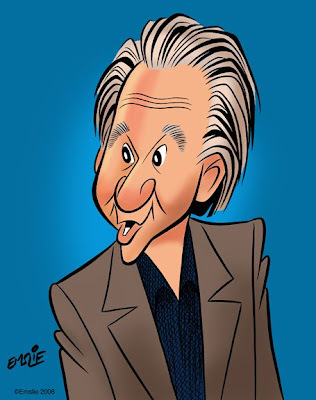 I personally find Larry a little tiresome most of the time, but I'll always tune in if the always interesting Bill Maher is the guest, as it also seems to bring out the best in Larry too. I just love Bill's candid, blunt responses on every issue. Besides that, I think it's great that he doesn't toe any party line and, while mostly liberal, he will also occasionally stand up for conservative types when he's impressed with their integrity. He's a big fan of Republican hopeful, Ron Paul, for example. I think Bill Maher is one of the most refreshingly honest guys I've ever heard, and it's because he really doesn't give a damn what people think of him or his opinions. In my previous post I showed some sample illustrations from a couple of Disney books that were painted completely in the traditional method of paint on illustration board. However, just so you don't get the idea that I am totally against using Photoshop, here are some samples that employ a hybrid method that I like to use. 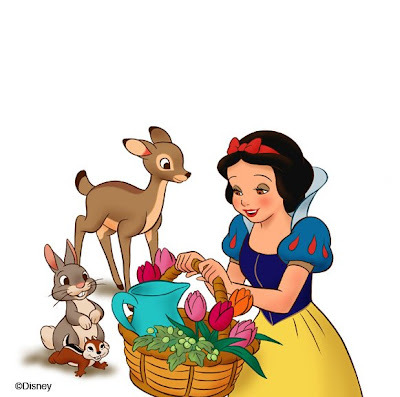 This illustration is from a book published a few years ago by Random House, entitled "Beauties in Bloom", which featured two spring themed stories, one featuring "Snow White" and the other, "Cinderella". This was the first in a series of seasonal books put out as part of the "Disney Princesses" program. Though I'm admittedly not keen on the packaging of the characters under the "Disney Princesses" banner, I do enjoy illustrating the classic characters in original new tales, rather than just retelling the film stories. After my final pencil layouts of the pages have been approved by Disney, I then separate the elements of characters and backgrounds. I transfer the background drawing onto a sheet of illustration board using graphite paper and a photocopy of my drawing that I can trace over with a sharp hard pencil. Once the background image is on the board, I start out painting in the large areas such as sky and grass using dilute washes of gouache on the surface which has already been pre-moistened with water brushed on evenly with a large flat brush. Once the larger expanses are in, I can start building up the details of bushes, trees, and surface texture on the ground. 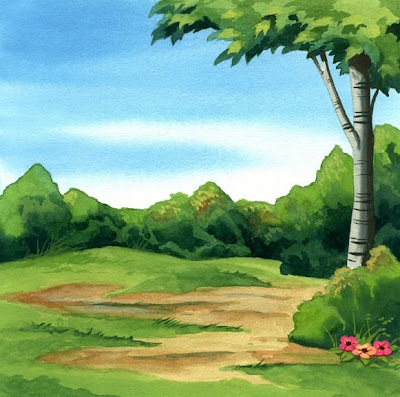 In the case of "Snow White", since the film's backgrounds were rendered in watercolour, I am using the gouache more dilute in order to approximate the look of real transparent watercolour. 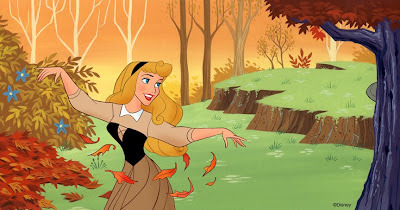 It's a bit of a cheat, but then I'm pretty sure that even the Disney artists used some opaque gouache in areas that needed lighter highlights over dark areas. Frankly, I've never been good at handling real watercolour, so I prefer to use gouache because I'm more comfortable with it. Once all of the backgrounds have been painted, then comes the rather tedious task of scanning them into Photoshop, usually in two or three sections because of the limited area on the scanner plate. I then have to reassemble them into single Photoshop files, which is often tricky due to some areas having scanned a bit darker or lighter than others, and therefore needing some adjustment. At this point, each page of character line art has to be converted into a transparent layer in Photoshop. This is so that I can then colour the characters by "painting" on a second transparent layer below, thus resulting in an image that really does approximate an animation cel with solid flat colours beneath the clean ink lines. What's nice about this method too, is that I can very easily go over separate areas on the line layer to change the colours of the line to something that relates better to the area of colour they contain. This is also the way they used to ink the cels in the early Disney feature films. Usually I keep this part pretty basic; just brown lines to surround warm colours and dark blue lines for blues and greens. I do a bit of tonal modeling on the areas of colour, but I keep that real basic too, otherwise the characters start looking too much like plastic. Once both backgrounds and character layers are in the computer, it is then a very easy and fun process of assembling them together for the final picture files. 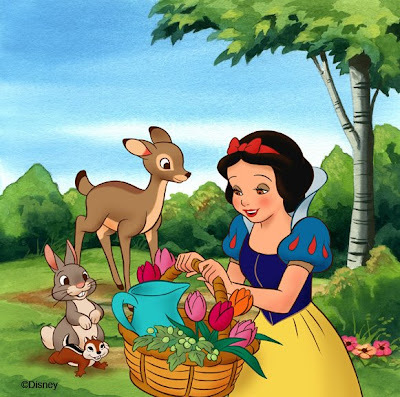 The benefit of working this way as well, is that if either Disney or the publisher require any changes to be made, it is not much problem to slightly shift or adjust the size or colour value of a character, without having to worry about the background. Finally, the real benefit for me is just sending the client a couple of CDs containing all of the page setups, instead of sending a bulky stack of original illustration boards by Fedex, which can be quite costly, as well as nerve racking, hoping they arrive safely. This is a scene from "Happy new Year, Pooh! ", that I did as one of a series of "Winnie-The-Pooh" books for Reader's Digest. It was a book of the month type of thing, where each title related to something in each month of the year. I did three books in the series. 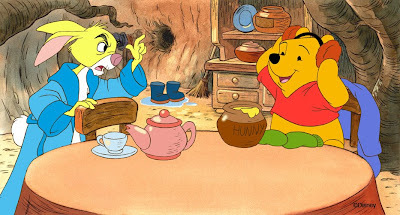 I quite like working with the Pooh characters, as well as doing the looser pen, ink and watercolour backgrounds that the film employed to adhere more to the original Shepard book illustrations. These backgrounds are more like coloured drawings than true paintings, and therefore are easier for me. Still, that doesn't mean I shy away from more painterly approaches, as I had fun trying to mimic the style of background artist, Eyvind Earle, in "Sleeping Beauty". Eyvind would paint in large, opaque, flat areas of colour, then build up the surface detail in multiple layers with his gouache. My paintings are a lot more basic than his, though, as he would create incredible textures and ornate design work in his film backgrounds. In June of 2007, I got to see the exhibit of original Disney animation art that was on show in Montreal (having first debuted in Paris). It was a real pleasure to be able to get up so close to some original Eyvind Earle backgrounds and analyze his approach in the brush work and order in which he would paint all of the elements. His gnarled, old tree trunks were incredible to behold. My simplistic "forgeries" pale in comparison, I'm afraid, but it sure is fun trying to paint in his style! In Praise of Real Paint! Since I've been extolling the virtues of using real paint on illustration board, I thought this might be a good opportunity to show some samples of the art I've done for various Disney books over the years. These are all painted with gouache, an opaque form of watercolours. 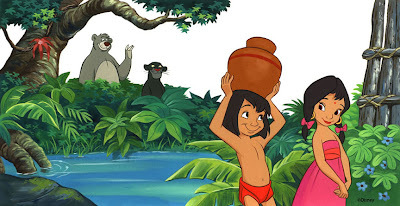 As I've often mentioned in previous posts, "The Jungle Book" remains my alltime favourite of the Disney animated features. Therefore, it was a real treat to illustrate this book for Random House, which was just a simple retelling of the story targeted to beginning readers. It was one of a series of books under the umbrella title of "My First Disney Story". I drew and painted four of these books and did the pencilling for a fifth that was painted by another illustrator. I am quite comfortable using gouache, and endeavor to paint the backgrounds fairly close to what they look like in the original films. Painting the characters in these illustrations is a bit tricky, and I always start by masking them out with frisket so as to keep the characters untouched as I paint the background behind them. That way, the characters are still just my pencil lines on clean white areas of board when I go to paint them in. As you can see, I keep the tonal rendering on the characters to a minimum, so they don't start looking all shiny like plastic. (I don't like the Disney video box art for that very reason.) I find that just a bit of dry brush shading on one side gives them the clean, crisp look that I prefer. 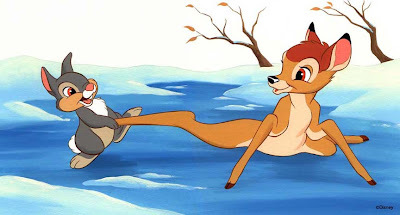 These samples from the "Bambi" book I illustrated for that same series unfortunately never saw the light of day. 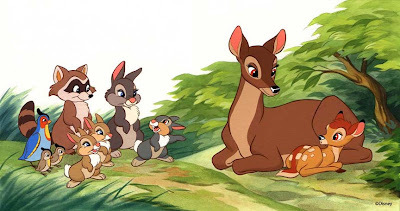 This particular book was sadly never published, as Random House execs were keeping a close watch on sales of the other books and weren't sure how well "Bambi" would do. Though I was still paid well for my work, it was a real disappointment not to see this one in print, as I had really enjoyed doing these paintings. 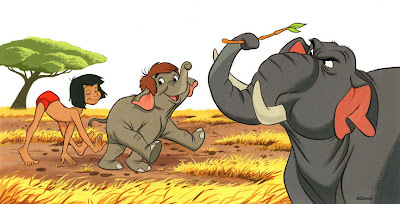 In addition to these two titles, I also illustrated two others in the series on "The Lion King" and "Snow White", as well as having pencilled the illustrations for a "Dumbo" book. "Mr.E, do you have to switch? I mean, it's not like you're not getting great results with your brush and ink. I guess it depends on working situations but, hey, if it ain't broke..."
Bitter - You know, it's funny you should ask that because I just had a similar conversation the other day with my buddy and fellow instructor, Johnny. I was telling him of my computer woes and frustration with accomplishing anything decent with Photoshop brushes, when he asked me the following: "Even if you were able to get satisfying results with the tools all operating to your liking, would you give up traditional media in favour of now working digitally?" After thinking it over for a moment, I replied, "No, actually I wouldn't." Here are my reasons why not. First of all, even if I was able to create the "perfect brush", suitable for digital inking and painting, it would still require constantly resizing and tweaking the settings of opacity, flow, etc. As it is, I can so easily get the line I want through the simple adjusting of pressure and angle on my sable brush. Also, wielding a real brush on a real sheet of illustration board, I can swivel the board to any comfortable angle in order to more easily pull a nice controlled ink line. I can't do that with the Wacom tablet, and would therefore require an expensive Cintiq to have that ease of mobility. As it is right now, I feel very constrained using the stylus and tablet. Also, the fact is I just love the intuitive feel of working with real media. There is something very satisfying about choosing the preferred surface on which to work, and feeling the tooth of that surface as I apply the brush with ink or paint. Likewise, there is the intuitive feel of knowing just how much to dilute the paint or not, depending on the desired effect, and then knowing instinctively just how much I can rework the paint on the board before it dries. Even aside from the tactile nature of real media, there is that appeal to the sense of smell, too. Fact is, I just love the smell of ink as I work. I've known that smell since starting to ink back when I was about 12 years old, and I'd miss it if I only inked digitally. Finally, there's the very basic reason that, when creating art digitally, there will never be such a thing as an original piece of art. Anything tangible to hold in your hands or frame on the wall will always have to be a printout. Frankly I love to look at my original artwork, where I can study it and remember how I achieved a certain effect by observing and analyzing the brush work. So why do I want to be able to learn how to ink and paint digitally? Perhaps somewhat as a matter of satisfying my artistic ego, knowing that I can keep pace with the computer age. Mostly, though, I think it's out of a fear that if I can't produce work digitally, that I become less marketable, as I'm finding that some clients now insist on having digital art. I once talked to an art rep who told me that he won't even look at anything inked traditionally anymore, as he wants everything in a vector line for reproduction at any size. So there I can't even win with Photoshop, as I'd need to learn that wretched Illustrator program with the insidious bezier curves/ pen tool. Personally, I find the digital trend highly disturbing and would rather continue to coast along with my traditional skills honed over a lifetime of working this way. At most, I would rather utilize the computer only in a hybrid fashion, combining my hand inked drawings with the ease of adding flat areas of colour with Photoshop. A little bit of rendering is okay, though I prefer not to overdo the adding of shadows and highlights, lest the image start to look more like plastic than flesh and cloth. 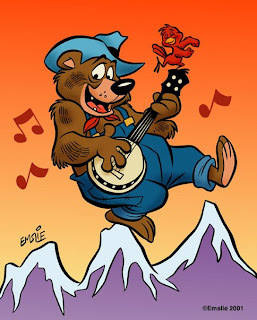 This image of the bear is pretty much the way I've used Photoshop in the past, and I will probably continue to use it simply as a colouring tool in most of my artwork, although I would still like to see what I could accomplish if I can ever get a handle on this digital painting stuff. So, did you hear the one about the guy who pushed the envelope while thinking out of the box, and kept a whole lot of agenda items on his radar until he got rid of the low-lying fruit? You did? Were we at the same meeting? Probably not. But you could have easily heard the same generic tunes at any number of meetings throughout the country. An actual, productive exchange of ideas in many business forums has been gradually usurped by a steady diet of mind-numbing jargon. Who among us has not been at a meeting where legions of employees around the table try to stifle their giggles as increasingly trite and outrageous gibberish reaches our ears and insults our brains. But is this just a work annoyance or does the use of jargon have any implications outside the workplace? The trend away from honest conversation in the workplace has its roots in a more generalized climate of politically correct discourse. At first glance, it appears to be a relatively benign practice. However, this phenomenon should be viewed in the larger context of words and expressions being continually evaluated and re-evaluated for their potential to offend groups and individuals. People are so terrified of potentially offending others that language becomes a mockery of itself. While we might joke that someone is follicularly challenged instead of "bald," or vertically challenged instead of "short," these types of expressions move us further away from the facts and into conversations and relationships that are based on a discourse reminiscent of walking on eggshells for fear of offending others. That is not to suggest that one must be honest to the point of being hurtful, but surely there is some need to develop a workplace and political discourse that is both respectful and truthful. A culture of fear has permeated political conversation in Canada as well. Though freedom of expression is enshrined in Canada's Charter of Rights and Freedoms, on an individual level, one is increasingly aware that political or religious positions that deviate from the unofficially sanctioned politically correct party line makes for ideologically dangerous living. How did this happen? Can the average Canadian take back freedom of expression without fear of career or social retribution and shunning? Is it possible to nurture a more genuine political and social discourse or will we be forever doomed to repeat regurgitated pleasantries and clichés and obfuscate facts in order not to offend? In order to reclaim honest conversation, baby steps must be taken. Truly enlightened employers, managers and employees alike can make efforts to move away from jargon and back to a lexicon of clarity. A general caveat is that by the time "street" slang is used by middle-aged parents ("gee son, that's phat"), much to the chagrin of their teenaged children, it's clearly no longer cool. Similarly, by the time business jargon moves from the web to the boardroom, you can be sure it's just as dead and useless. In the broader scheme of things, individuals can encourage their elected officials to repeal Section 13.1 of the Canadian Human Rights Act, that labels it a "discriminatory practice" to communicate messages that are "likely to expose a person or persons to hatred or contempt." In real life this amounts to speech that is "likely" to offend someone at some point. We need to collectively buck up, stop whining and allow the appropriate bodies to intervene only when speech becomes a threat of physical violence or incitement (call the cops) or libellous (call your lawyer). In the meantime, the next time someone tells you to get your ducks in a row, going forward, how to inform the discussion, or what struck them most about what-ever, take a deep breath, take a bold step forward and politely demand clarity. You could be pleasantly surprised at the result. I've been going through computer hell recently. The 20" iMac that I'd had for only two years was having a power problem, causing it to shut itself down completely after I'd only put it into Sleep mode. It would be okay if I went to use it within a half hour or so of putting it to sleep, but an hour or more and it would shut down. I must have called Apple tech support at least a half dozen times, each time with someone walking me through some test to try and pinpoint the problem and hopefully resolve it. No luck, I'm afraid, so then it was time to take it in for service. At the Apple Store they figured it was the power unit and replaced it, assuring me the next day that they had tested it out and it seemed fine. But once I'd hooked it back up at home, it started doing the same damn thing again. When I took it back and they reassessed it, they determined it had a faulty motherboard and would be very difficult or impossible to repair. As it was still covered by the warranty, they told me the only option they had was to give me a brand new computer. In fact, they'd already begun transferring my data over, assuming I'd be receptive to the offer. Now getting a new iMac in exchange sounds great, right? I thought so too, until I got it hooked up and running at home. I noticed that the screen looked a little unusual, sort of more contrast in the desktop wallpaper image I had on there. Also, I noticed that text at the top of a webpage seemed bolder than it did when it scrolled toward the bottom of the screen. However, it was only when I opened up one of my art files to work on that I realized just how much of a problem there was. As I was working, I noticed that when I altered my head position up or down by only a couple inches, that the tonal value of the image would vary lighter to darker. Standing up and looking down at the screen from a sharp angle made the display image appear washed out, whereas looking up from below made everything very dark, in fact causing almost a negative effect at the extreme angle with black areas turning light against midtones. Very strange indeed! I thought a search on Google might provide some insight into the problem. Boy, did it ever! I soon discovered that Mac fans were in an uproar about what apparently were inferior quality displays that had been outfitted on all of the latest 20" models. In fact, a class action lawsuit has been launched against Apple for making claims on their website that would seem to differ from what the reality is with these new models. Anyway, I took back the computer the next day and complained that, had I known the screen was vastly inferior to what I'd given up, I would never have agreed to the exchange in the first place. To be fair, the Apple employees were quite understanding and accommodating, and the manager agreed to upgrade me to the 24" model which still had the superior technology in the display. Yes, I did have to pay a little extra to upgrade, but the manager met me halfway, knocking off half the price difference. So, currently I have a 24" iMac that has a beautiful screen and everything seems to be operating as it should.